This object was imaged from Great Shefford while it was on the NEO Confirmation Page on 2002 Oct 23.9 and again on 2002 Oct 27.9. The images from the second date appeared to show some odd tail activity. An animation of 11 images, stacked into three frames shows the comet slowly drifting south-west, with tails pointing east and west moving with the comet. These details were sent to the Minor Planet Center and IAUC 8002 was issued two days later after Tim Spahr, observing with the 1.2-m reflector at Mt. Hopkins had also noted a coma and a tail in p.a. 330°. Stacking all the frames into a single image shows the detail with more clarity on the right of the animation. 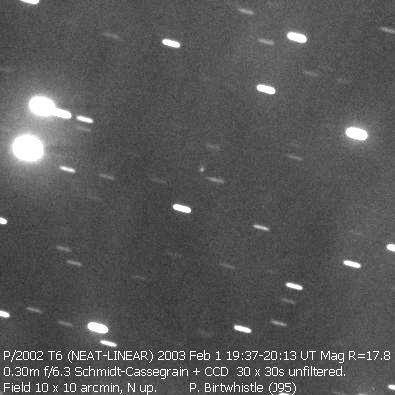 P/2002 T6 had brightened by a couple of magnitudes in the three months after being announced when it was imaged on 2003 Feb 1, approaching conjunction with the Sun (perihelion occurring on 2003 June 27). Some slight tail activity can be seen to the north. Seven months later and the comet was just coming out of conjunction with the Sun when it was caught here in the north-east of Orion at the end of August 2003. 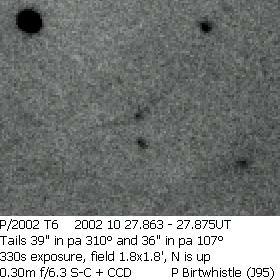 Two months after perihelion, a stubby, broad fan of tail can now be seen to the north of the comet. Each frame is a stack of five 30s exposures, field is 5'x5', N up.